Happy Birthday Larry Rivers (1923-2002)! Larry Rivers. 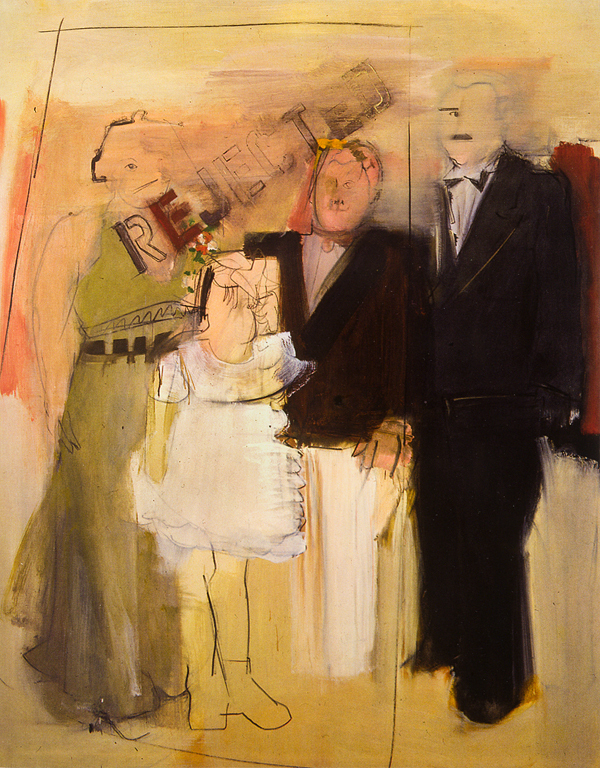 The Burial, 1951, oil on canvas, 1951. Fort Wayne Museum of Art. Larry Rivers. Larry Rivers as Felix Nussbum, 1997 pastel & pencil, 25x27in. Photo: Jewish Artists and the Bible, p135. Larry Rivers was born as Yitzroch Loiza Grossberg on August 17, 1923, to Samuel and Sonya Grossberg, Jewish immigrants from the Ukraine who lived in the Bronx. He changed his name when he began performing as musician in 1940. He was successful jazz saxophonist, playing regularly in New York from 1940-1945. Photo: Jewish Artists and the Bible, p115. With the exception of some relatively early paintings that seem to derive from his own American Jewish life cycle, most of Rivers' work does not address specifically Jewish themes. But there are more of these beginning in the 1980s, including several works addressing the Holocaust, and specifically well-known victims. Rivers directly associated himself with the painter Felix Nussbaum in his work Larry Rivers as Felix Nussbaum (1997), where he places himself in the position and with the attributes of Nussbaum's unforgettable self-portrait of a hunted Jewish artist in hiding. In the late 1980s he painted a series of portraits of the Auschwitz survivor and writer Primo Levi, who died in 1987. 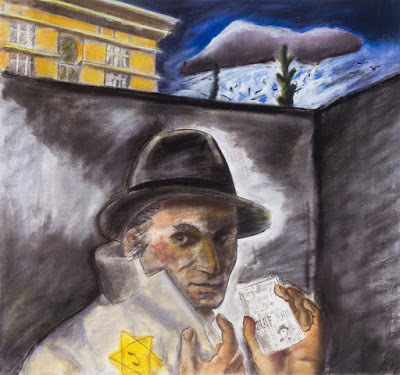 The 1980s and early 1990s was a time of great attention to the Holocaust, culminating with the opening in 1993 of the Holocaust Memorial Museum in Washington, and many Jewish painters were drawn to Holocaust themes, and some were specifically commissioned for these works. Rivers was a multi-talented artist. Besides music and painting, he made sculpture and films. For more on Larry Rivers as a Jewish artist see Samantha Baskind, Jewish Artists and the Bible in Twentieth-Century America (Penn State Universality Press, 2014). 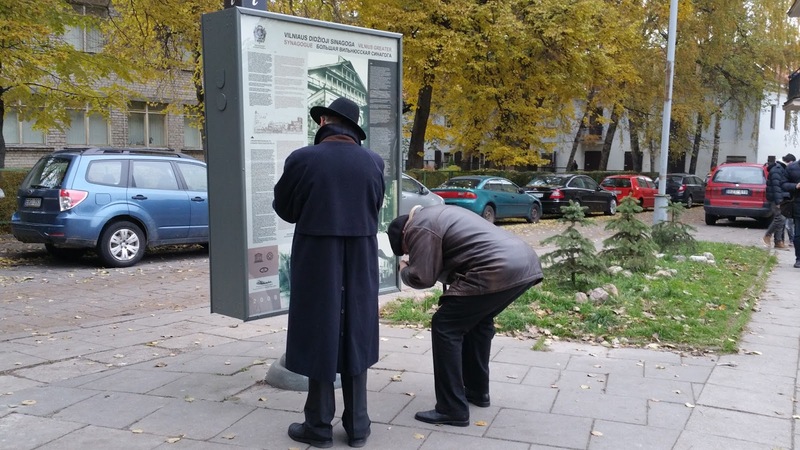 Lithuania Conference: How to Commemorate the Great Synagogue of Vilna Site? Vilnius (Vilna), Lithuania. Great Synagogue (destroyed) showing four column support bimah. Photo: J. Bulhak. Vilnius, Lithuania. School on part of site of Great Synagogue. Photo: Samuel Gruber. Vilnius, Lithuania. Site of Great Synagogue, Archaeological excavation, 2011. Photo: courtesy Lithuanian Ministry of Culture. The organization Litvak World and the Martynas Mazvydas National Library of Lithuania are hosting an international conference in Vilnius, Lithuania September 4-5, 2017 on the topic "How to Commemorate the Great Synagogue of Vilna Site?" The question has been debated since even before the fall of the Communist government in 1990. 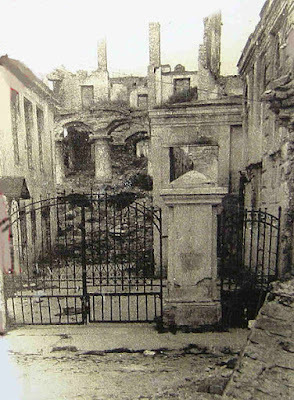 The standing ruins of the synagogue were demolished between 1955 and 1957, and a school was subsequently built on part of the site. The Great Vilna synagogue, built in 1633, was widely known in Europe for centuries as the center of spiritual, cultural and social life of the Jewish community. It was damaged during the Nazi occupation and totally demolished by the Soviets after the World War II. 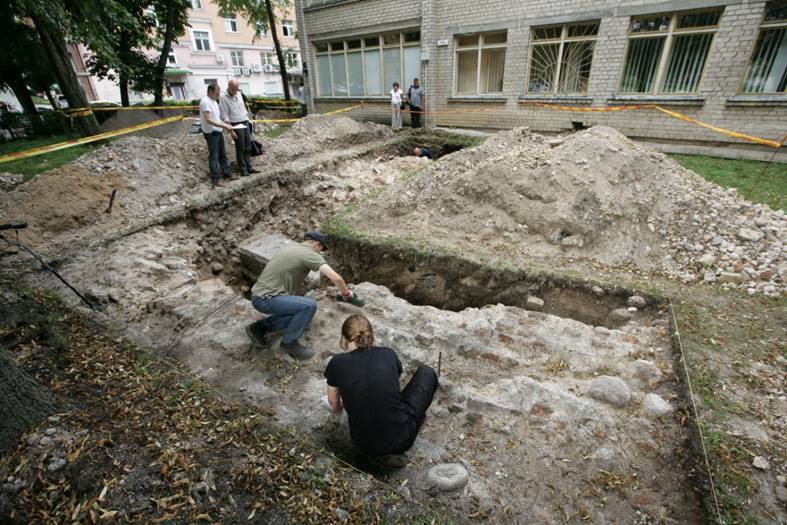 Archeological research proves that authentic remnants of the Great Vilna synagogue still remain buried 2 meters below the ground level. 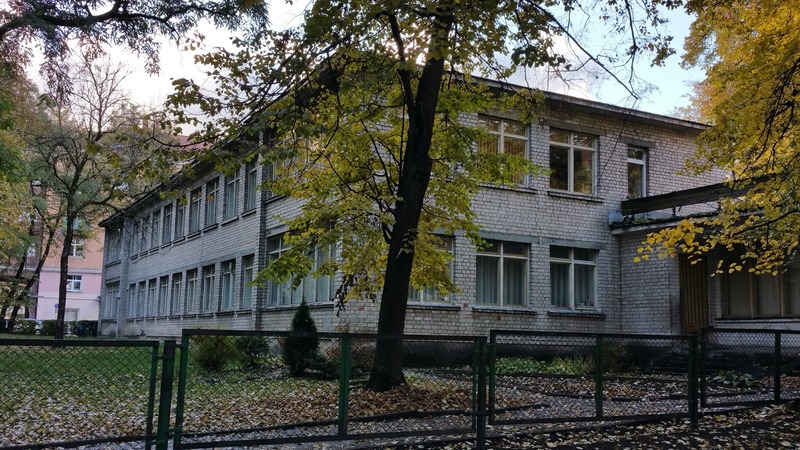 The aim of the conference is to discuss the commemoration aspects of the Great Vilna synagogue site, meeting its significance and modern heritage protection standards. The working languages of the workshop will be English and Lithuanian. Participation is free of charge but registration is required. I'll be giving a presentation: The Stone Shall be a Witness: Strategies for the Preservation and Presentation of Destroyed Structures, which will explores alternative strategies for the recovery, exploration, and presentation of destroyed historic buildings in different countries. These include the creation of protected archaeological zones, the symbolic re-creation of building elements, the creation of monuments, and the full scale recreation of lost structures. The presentation weighs how the causes of destruction (war, urban renewal, or natural disaster) and the length of time between destruction and re-consideration affect the goals and methods of preservation. The illustrated paper will include examples from Germany, Holland, Italy, Ukraine, the United States, and elsewhere. I've written about many of these examples on this blog, and some of these and more examples will be explored in greater detail by many speakers at the conference. Vilnius (Vilna), Lithuania. Great Synagogue and library (destroyed. Photo: J Bulhak. Vilnius (Vilna), Lithuania. Great Synagogue after World War II but before during total destruction. In the past several decades all sorts of proposals for the Great Synagogue site have been put forward - an archeological park, monuments, museums, reconstructions, and more, but little has been done to commemorate the site or to educate the public about its history and lost architecture other than the erection of a monument to the Vilna Gaon and the creation of single standing information sign. In recent years archaeological excavation at the site have revealed significance remains of the synagogue, which stood as partial ruin until it was demolished in the mid-1950s. Because the floor level of the sanctuary was significantly below ground level when it was built, it is almost certain that parts of the original floor and the foundations for the massive bimah, columns and other architectural features would be revealed through more comprehensive excavations. This would require the demolition of the modern style school - which most proponents of almost any type of commemorative treatment the site seem to support (we'll see about this a the conference). In the past and as recently as 2013 government officials in Lithuania (and some in Israel, too) have promoted the idea of restoring or rebuilding the massive synagogue. Many, including myself, have commented in the past that this would be expensive (in the face of so many other Jewish heritage cultural needs), impractical (the building can never be brought back to anything close to what it was or how it was used), ahistoric (at best the this would be a replica), and ultimately inappropriate for a variety of other reasons. I look forward to hearing what others say at the conference - and I will keep an open mind. Naturally, since 1990, as the Jewish and Holocaust history of Vilnius has been researched, debated, neglected, exhibited and sometimes denied, and as other sites have been commemorated (or not) in Lithuania, the needs for the Great Synagogue site have shifted or perhaps come into clearer focus. Vilnius has become a very new and different city than it was before 1939, and even in the 1980s. Incorporating the past - and especially the Jewish past - is in some ways easier than under Communism, but in many ways harder, too. The placing of responsibility for death and destruction in the Nazi and Communist periods remain highly contested. I'm expect that participants at the conference will grapple with these challenges. 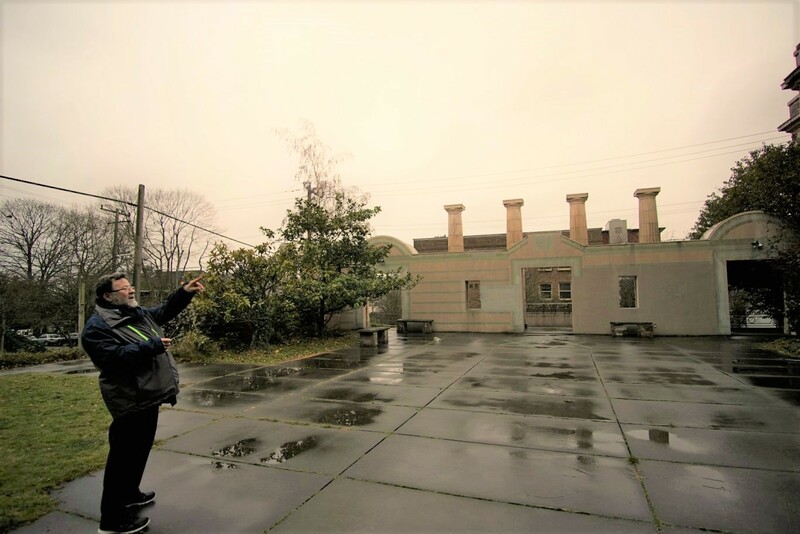 In the end the future of this site in intertwined with the ways in which Jewish history, art, and architecture are presented throughout the city and the country, and how the events of the Holocaust of presented and understood. Vilnius, Lithuania. This sign is what commemorates the Great Synagogue today. Photo: Samuel Gruber 2015. Seattle, WA. Temple De Hirsch, 1908 (demolished). Seattle, WA. Remains of Temple De Hirsch, 1908. Photos: Samuel Gruber 2016. A few weeks ago I wrote about the uncertain fate of the ruins of the Beth HaMidrash Hagadol Synagogue in New York and promised to take a look at how other places have preserved ruins or fragments of destroyed synagogues. Sometimes these fragments are the results of archaeological excavation, as is the case in South America, the Caribbean, and sometimes in Europe, and of course, Israel. Sometimes they are the result of violent destruction, as in Europe where many synagogues were only partially destroyed in the Holocaust but their ruins were left intact in the subsequent years. Other times natural calamities have claimed buildings. An earthquake in Vidin, Bulgaria; a landslide in Pitigliano, Italy; and fires in New York and elsewhere. I do not plan on addressing this topic systematically, chronologically, or in any other obvious order. Rather, over the next few weeks I will post a series of vignettes which demonstrate a variety of approaches; some successful, some not. The need to protect, preserve and present ruins is hardly unique to Jewish heritage sites. Many of the lessons and methods considered by stewards of ruined synagogues derive directly from the field of ancient and medieval archaeology. 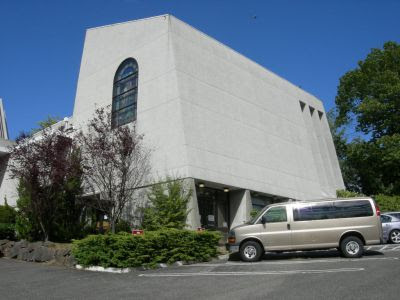 In 1993, the congregation of Seattle, Washington's De Hirsh Sinai Temple, which was formed 1971 in a merger between Temple De Hirsch (Seattle, founded 1899) and Temple Sinai (Bellevue, founded 1961) decided after long deliberation to demolish the historic sanctuary of Temple De Hirsch at Union Street and 15th Avenue. This building already was little used. For several decades it had functioned as an often empty annex to the larger modern style sanctuary building built in 1960 and a smaller modern chapel added in 1974. Seattle, WA. Temple De Hirsch Sinai, 1960. Photo: Samuel Gruber 2016. The unsuccessful efforts to reuse the old synagogue as a concert hall are well documented. 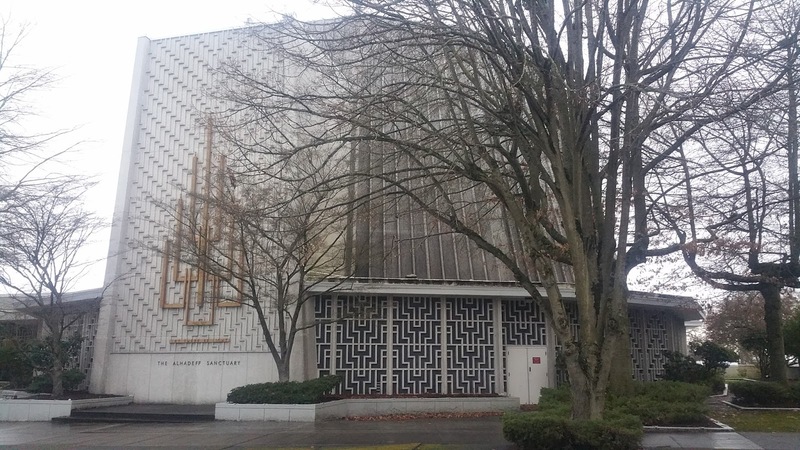 The old sanctuary, listed as a Seattle Landmark in 1980, and placed on the National Register of Historic Places in 1984, was known for its fine acoustics. The congregation held off demolition for several years while strong effort was made to transform the space into the "Landmark Concert Hall," a recital hall with about 550 seats but unfortunately, the organizers of the new project could not raise the necessary funds in the time given. Carrying the empty and now-derelict building risked dramatically raising the congregation's insurance rates for all their buildings, and the demolition was carried out. A small park or plaza was created on the site. Seattle, WA. Site of former Temple De Hirsch. Photo: Jonah Gruber 2016. I was last at De Hirsch Sinai on a cold wet day last winter, so no one was using the outdoor space, and of course it looked dreary. In good weather, however, the paved space is a flexible one and can serve many purposes. Since it is still owned by the congregation and part of the greater synagogue facility, its identity and programming are fully "Jewish." But the space is open to the public, and can be used as a little park or play area by anyone in the neighborhood who wants. While the new building faces a busier commercial street, this site of the original sanctuary is now on the rear of the lot an still part of a residential neighborhood. The compromise solution was to preserve the space of the old building as a small paved park with a few elements of the building preserved. 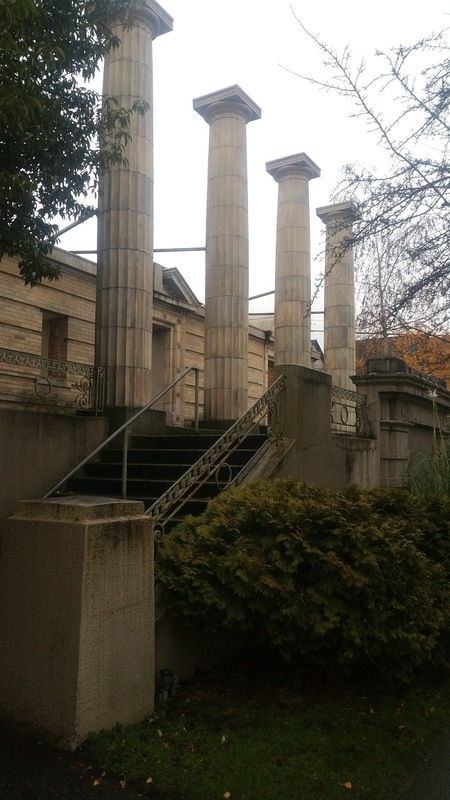 Notably, the entrance stairs, the four Doric columns of the entrance portico, and part of the entrance wall with the main doorway were kept and these now give access to the small plaza. 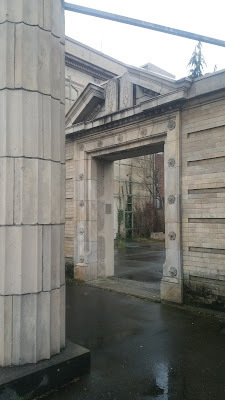 A stylized representation of the original facade - which had already lost the tops of its towers in the 1950s - is affixed to the wall of another building, and visible from the little park. Seattle, WA. Site of former Temple De Hirsch. Photo: Samuel Gruber 2016. The demolished sanctuary was designed by architect Julian F. Everett in the Neo-Classical style and was dedicated May 29, 1908. An adjacent Temple Center opened in 1924, housing a religion school and other organizations; a wing was added in 1951. 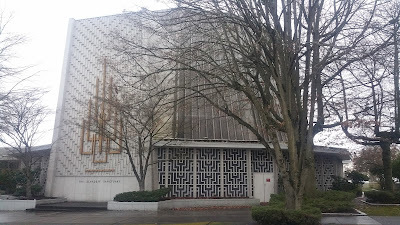 The current sanctuary at 16th Avenue and Pike Street—the opposite corner of the same block as the old temple—was completed in 1960. The old sanctuary was virtually unused from 1974 when a new chapel was built, and many of its interior elements were moved to the new space. Sometimes historic buildings are destroyed because the land they sit on is valuable and will be developed. 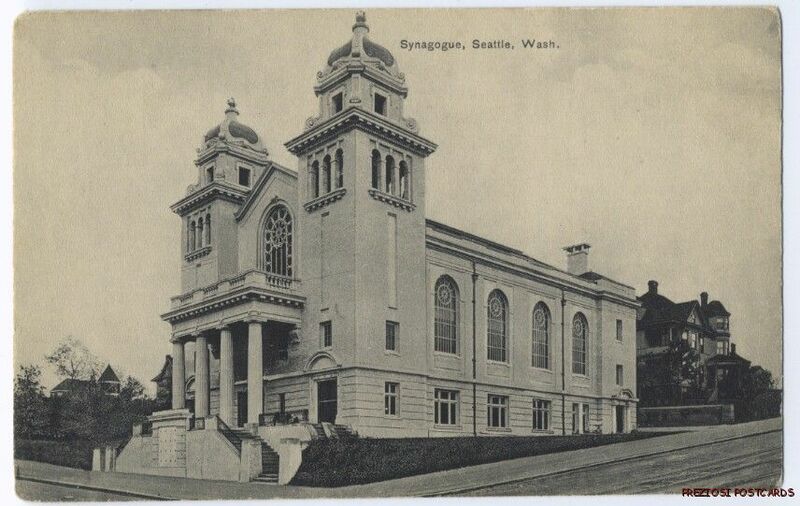 Or sometimes after the demolition the building is replaced with a new version - so that the mission of the church or synagogue is continued in a more up-to-date form. In Seattle, neither of these scenarios was the. The congregation had already built their new iteration of a sanctuary on an adjacent property, and despite demand for real estate in Seattle, the lot of the old sanctuary was not rebuilt. The building was demolished because the congregation had no pressing need for it - and because the cost of maintaining it was getting higher and higher without commensurate benefits. After attempts to redevelop the sanctuary into a performance and concert hall failed, the congregation could not continue to carry the building. Instead it was demolished and many of its parts were saved the ark, and chandeliers and large stained glass window were removed to the modern chapel. And a few distinctive parts of the structure were saved to frame a pocket park. Thus, some memory of the old sanctuary can be accessed through the recognition and reuse of the some of its parts. Seattle, WA. 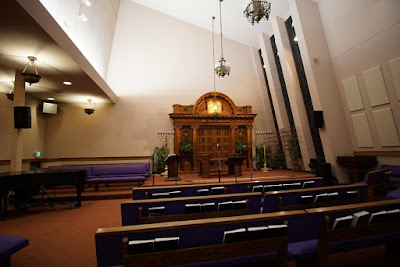 Temple de Hirsch Sinai. Chapel, ark from old sanctuary. 1974. Photo: Samuel Gruber 2016. Seattle, WA. Temple de Hirsch Sinai. Chapel, Moses window from old sanctuary. 1908/1974. Photo: Samuel Gruber 2016. Seattle, WA. Temple de Hirsch Sinai. 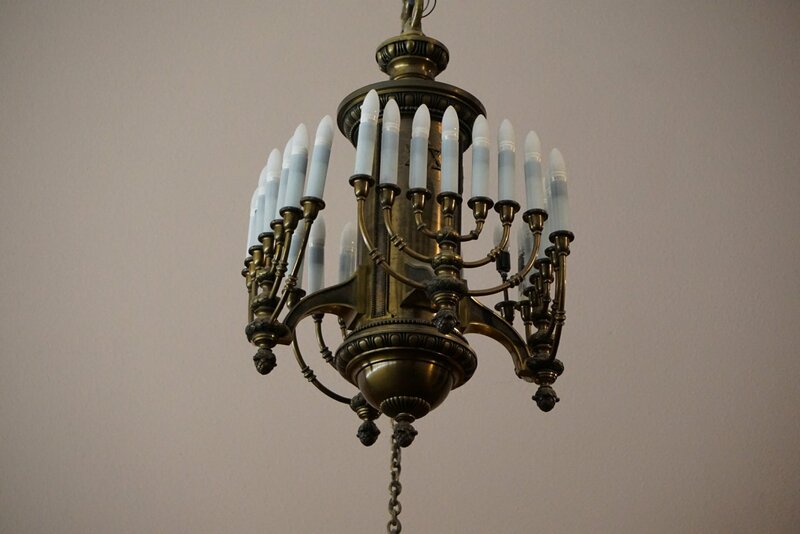 Chapel, chandelier from old sanctuary, 1908/1974. Photo: Samuel Gruber 2016. This blogpost is not intended to debate the Seattle demolition decision. There have been some close looks at this process as a case study in historic preservation, where there was mostly good will, but many competing factors. Rather, I want to highlight the decision that was made about how to treat the site after the demolition - since it is of continuing relevance today. I'll pick up this discussion soon in "Preserving Synagogue Ruins Part II." New York, NY. Stanton Street Shul. Sign for the month of Kislev.. Photo: Samuel Gruber 2017. I recently wrote at length about the Stanton Street Shul in New York and its importance as a surviving 'tenement shul.' 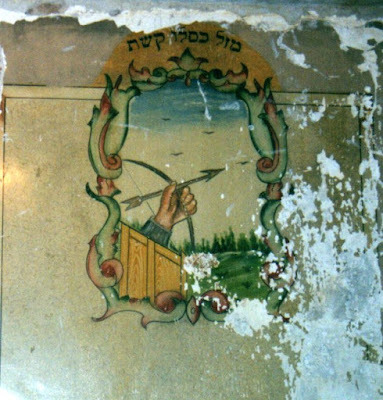 The Shul's rare intact wall decoration of mazoles (or mazzalot) make the interior especially noteworthy. Mazoles are the twelve zodiac signs, well known in ancient, Jewish, and Christian art (and in the horoscope section of the daily newspaper). When we say "Mazal Tov" to one another we are continuing a tradition that dates back millennia, to the a time when astrology was deemed an important factor affecting one's actions and experiences. 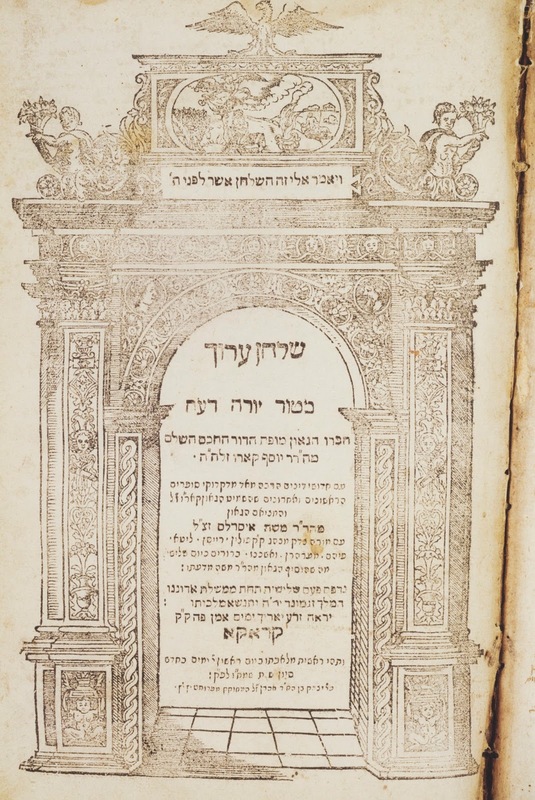 Even though traditional Judaism has frowned on assigning power to heavenly bodies, almost certainly folk traditions remained strong in many Jewish societies. This is just one front in the old debate about whether there was major distinction between "rabbinic Judaism" and "normative Judaism" in the past (as there is today). The zodiac signs are, in Hebrew and Yiddish, mazoles. So to wish someone "Mazal Tov" is to wish that they - or a particular action - are under a good zodiac sign. Perhaps as a way of taming belief in astrology, the Hebrew calendar was early twinned to the Near-eastern zodiac, so that from an early date constellation signs popular in the pagan world overlapped with the Jewish sense of both cosmic and seasonal time. As the constellations revolved in the heavens, so too did the cycle of the year progress. 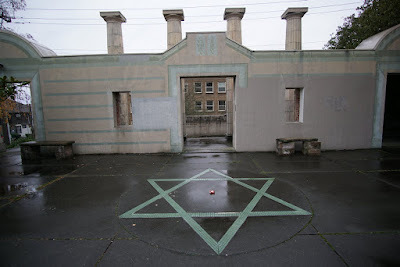 Thus, in the synagogue the depiction of the zodiac signs did mostly likely not refer to the power of planets and stars, but to the regular order of the Jewish calendar, with its weekly and monthly rhythm punctuated by fasts and festivals. 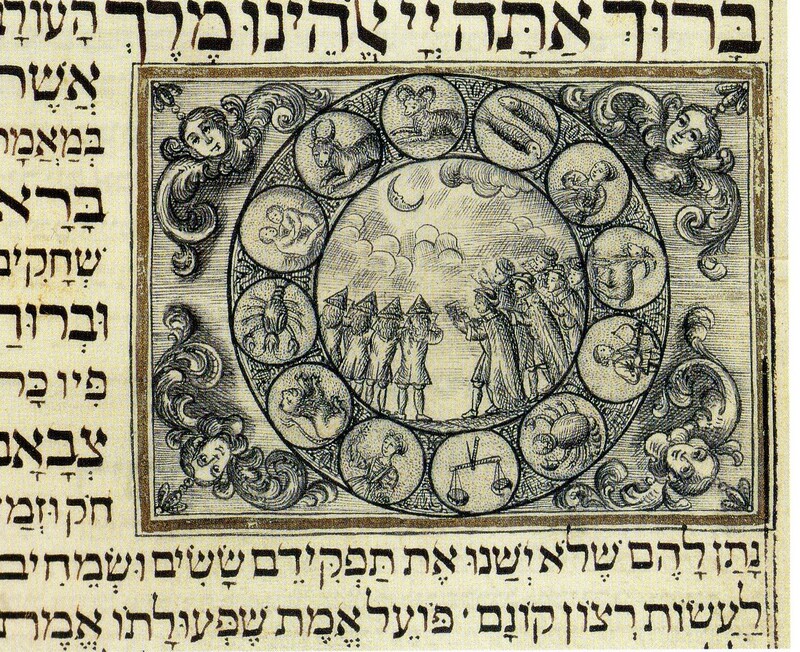 Over the years, artists have adapted traditional zodiac iconography dating from antiquity to conform to Jewish law and changing traditions and preference. Notably, in synagogue mazoles in Europe and in America in the early 20th century, the human figure is almost always replaced by other devices. 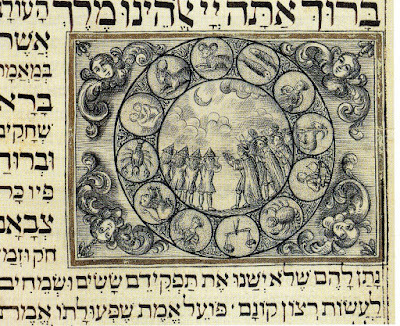 Of the body, only the human hand is shown (see photos of Elul/Virgo and Kislev/Sagittarius below). The water-carrier becomes a well; the twins become paired animals or birds. But this was not always the case. From antiquity through the 18th century a wide range of human types and poses were included in traditional zodiac representations. Many examples can be seen in the catalogue of the Israel Museum exhibition Written in the Stars (The Israel Museum, 2001). Based on a still partial analysis of late 19th and early 20th century mazoles in a variety of media, it appears that a more conservative interpretation of the Second Commandment's restrictions on the representation of the human form was ascendant in Orthodox Judaism. Coincidentally - or perhaps in direct relation - at the same time it was increasingly common for more secular Jewish artists to explore and represent the human form in both abstract and realistic depictions. Of what were probably many sets of painted mazoles in North American immigrant synagogues, to my knowledge, only the Stanton Street Shul set remains original, complete, and intact in New York City. Elsewhere, such as at the former Chevra Linas Hazedek in the Bronx (a Baptist church since the 1970s), a complete of mazoles inserted into stained glass windows also survives from ca. 1932. 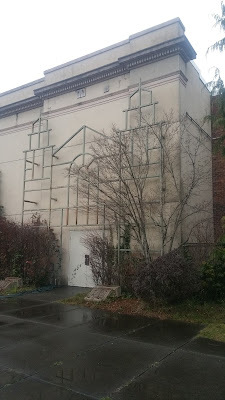 Mazoles were painted at the former Bnai Moses Joseph Zavichost-Zosmer Shul, 317 East 8th St (known as the 8th Street Shul). That shul, however, has been converted into a luxury townhouse and as far as I know all the features of the synagogue, including the painted mazoles, were destroyed. I saw the mazoles still partially intact during the renovation process in 2001 (You can still see this shul in the 1998 movie Pi). New York, NY. Former Bnai Moses Joseph Zavichost-Zosmer Shul, 317 East 8th S, before conversion to residential use. Photo: Samuel Gruber 2001. As can be seen in a comparison of the sign for the months of Kislev, it does not appear that the same artist decorated the walls at the Bnai Moses Joseph Zavichost-Zosmer Shul and at Stanton Street. Though we don't know their names, we should not be surprised that there were several - and maybe many - local painters who could do this work.At this point we now next to nothing about these painters. How did they make their livings? Perhaps as sign painters? Printers or lithographers? These were common immigrant Jewish professions. New York, NY. Former Bnai Moses Joseph Zavichost-Zosmer Shul, 317 East 8th St. Sign for the month of Kislev.. Photo: Samuel Gruber 2001. Other New York examples of mazoles have either been destroyed or “restored” by over-painting as at Linas Hazedek in Brooklyn, and sometimes substantially reinvented by mixing old and new designs as at the Bialystoker Synagogue in Manhattan. I'll write more about both these synagogues in future posts). New York, NY. Bialystoker Synagogue. Sign for the month of Kislev.. Photo: Samuel Gruber 2017. Interestingly, the representation of Kislev in the stained glass windows in the women's' gallery at the former Chevra Linas Hazedek in the Bronx shows the more common - and originally pagan - representation of the archer as centaur-like half beast, half man. This image is used in many older zodiac representations - pagan and Jewish. 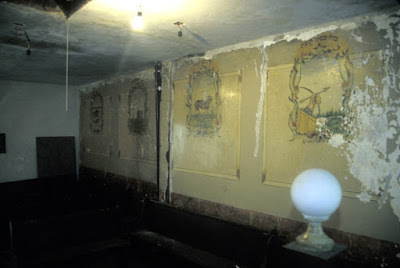 The difference here may be that the Lower East Side murals were probably painted by locals, perhaps even congregants. They would more closely reflect the wishes the congregations religious leaders. 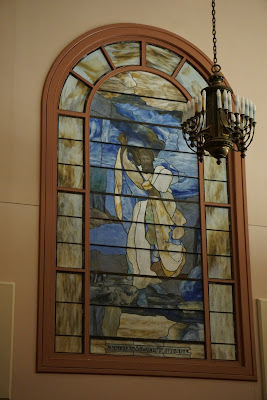 At Chevra Linas Hazedek, however, though there are wall paintings, too; the mazoles and also representations of the Twelve Tribes are in stained glass. These would have been ordered from a studio, and there would have been less opportunity for local control over the images (I'll be writing more about the sources of synagogue stained glass in future blogposts). The Bronx, New York. Former Chevra Linas Hazedek (1932), now Green Pastures Baptist Church. Stsined glass window in women's gallery. Sign for the month of Kislev.. Photo: Samuel Gruber 2017. The mazoles at Stanton Street are set in painted panels or niches, each defined by a pair of painted columns. 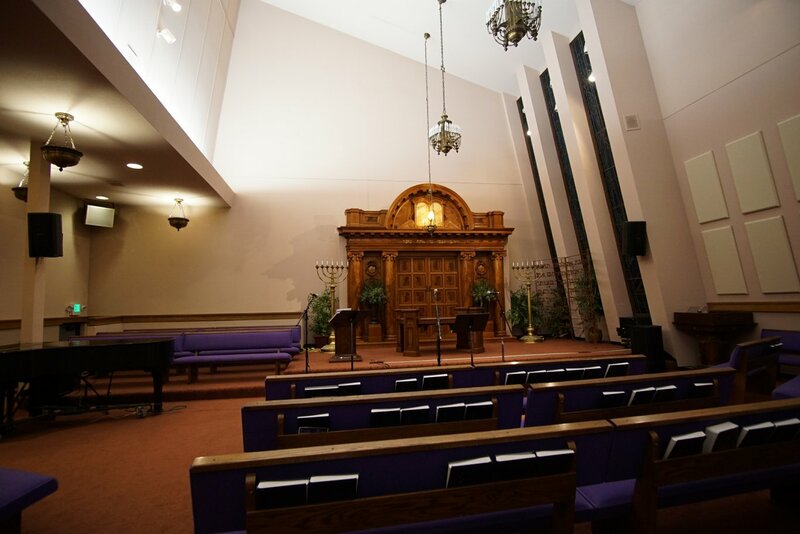 The panels cover the long side walls of the sanctuary beneath the women's gallery - as was also the case at Bnai Moses Joseph Zavichost-Zosmer Shul. Between each pair of painted faux-marble columns is a window-like panel, revealing the zodiac sign in a landscape setting. Each of these panels is shaped as a square set in a diamond, with an interior border that twists and turns to create a more intricate knotted pattern, more like the edge of a textile than an architectural feature. Appearing to grow from all sides of the panel are painted wispy blue-green tendrils which loosely fill much of the rest of the space within each pair of columns. The Hebrew name of the month represented by the mazol is painted on the lower part of the wall, beneath the lowest tendrils. The practice of using framing columns for images goes back to antiquity. It has also been regularly used in churches as an organizing framework for both 2-dimensional and 3-dimensional wall decoration. 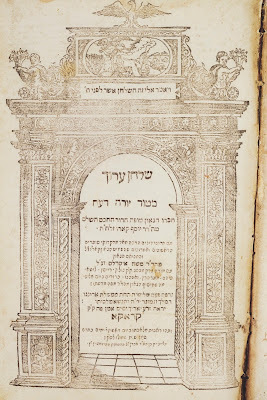 In the Jewish tradition it can be found on the title pages of hundreds of early printed religious books, and though these columns or piers often support arches to create gateways, the framing effect is essentially the same. NY, NY. Stanton St. Shul. Here one can see the framing columns for the month of Tishrei. Below is faux-marble wainscotting, which has recently been repainted. Photo: Samuel Gruber 2017. NY, NY. Stanton St. Shul. Nisan. Photo: Samuel Gruber 2017. NY, NY. Stanton St. Shul. Iyar. Photo: Samuel Gruber 2017. NY, NY. Stanton St. Shul. Sivan. Photo: Samuel Gruber 2017. NY, NY. Stanton St. Shul. Tammuz. Photo: Samuel Gruber 2017. NY, NY. Stanton St. Shul. Av. Photo: Samuel Gruber 2017. NY, NY. Stanton St. Shul. Elul. Photo: Samuel Gruber 2017. NY, NY. Stanton St. Shul. Tishrei. Photo: Samuel Gruber 2017. NY, NY. Stanton St. Shul. Cheshvan. Photo: Samuel Gruber 2017. NY, NY. Stanton St. Shul. Kislev. Photo: Samuel Gruber 2017. NY, NY. Stanton St. Shul. Tevet. Photo: Samuel Gruber 2017. NY, NY. Stanton St. Shul. Shevat. Photo: Samuel Gruber 2017. NY, NY. Stanton St. Shul. Adar. Photo: Samuel Gruber 2017. The International Survey of Jewish Monuments and the Center for Jewish Art Plan to Document All Synagogue Wall Paintings in North America.